The soundtrack to the 2006 Irish movie Once, featuring music by Irish musician Glen Hansard of the band The Frames and Czech musician Marketa Irglova, is my favorite movie soundtrack. It literally has not left my car CD player in the last five or so years. I also love their CD Strict Joy, released under the name Swell Season, and am eagerly awaiting the June release of Glen's first solo CD, Rhythm and Repose. I've seen them perform live several times and they're amazing musicians. Glen in particular is one of the most passionate musicians I've ever seen live, and I'll continue to go see him whenever he's in town. So it was with much excitement and trepidation when I heard that there was going to be a stage musical version of the film. I love the story and the music, but would they be able to translate the magic of the film to the stage without ruining a good thing? The reviews were pretty good, but I had to see it for myself (hence this trip to NYC). Good news: I loved it almost as much as the original. The musical is different from the film; where the film is subtle and internal with much left unspoken, the music is more cutesy and external with things more obviously spelled out (sometimes literally). But the film is so sparse that I suppose they have to fill it out for a live audience. 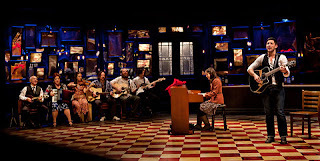 I think it's quite successful and well done; the magic of Once is retained on stage, if in a slightly different form. 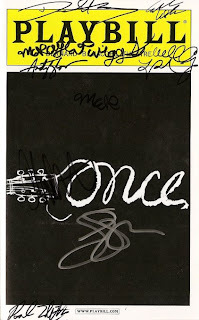 The general plot of Once, both film and musical, is this: a street musician who works at his dad's vacuum repair shop has recently gone through a bad breakup and is disenchanted with life. He meets a young Czech immigrant woman who's full of life and encourages him to make music and get his girl back. In the movie, this encouragement is more subtle, but in the stage musical the girl is relentless in convincing the guy to move on (the characters have no names). This sort of perkiness could be annoying, but in the hands of Cristin Milioti it's quite charming and irresistible. She walks the fine line of being sweet and quirky without being cloying. Steve Kazee as the guy is no Glen Hansard, but he may be the next best thing. His voice is smoother than Glen's, more musical theater than folk-rock, but by the time he finished the first song, the raw and heart-wrenching "Leave," he had won me over. He effectively played the heartache of the character and his slow coming back to life through the interaction with this girl and the music they make together. What I love about the movie, that thankfully they've kept in the musical, is that these are two people who meet and have an intense connection that profoundly changes the direction of each of their lives, and then they continue on different paths. In a Hollywood movie, they would end up together, but this seems much more real and poignant somehow. It's a true love story, but one that you don't often see on screen or stage. I ran across a quote by Albert Schweitzer that reminds me of this show: "In everyone's life, at some time, our inner fire goes out. It is then burst into flame by an encounter with another human being. We should all be thankful for those people who rekindle the inner spirit." That's what these two people did - rekindle each other's inner spirit. The two strong leads are surrounded by 11 talented musician/actors (one of whom is an adorable little girl) who play instruments (fiddle, guitar, drums, etc. ), sing, act out several roles, and generally contribute to the atmosphere of Irishness. Standouts in the cast include the impressively bearded Paul Whitty as the owner of the music store who's smitten with and protective of the girl, and David Patrick Kelly (of Twin Peaks fame) as the guy's stoic but supportive father. But really they're all wonderful musicians and actors. When not involved in the action, they sit around the edge of the stage, which is made up to look like an Irish pub (from which you can buy overpriced drinks before the show, although sadly they do not have Guinness, which is how you know it's not a real Irish pub). The scene transitions are interesting and graceful, with the pub serving as a bank office, the girl's apartment, and the guy's bedroom. The choreography is sparse and lovely, very organic to the story and characters. One effect I think they could do without is the surtitles. At times they display the dialogue in Czech as it supposedly is being spoken by the Czech characters, while we hear them speak English. Later they display the English translation when the girl is speaking Czech. It's a little confusing and inconsistant. This seems an unlikely Broadway musical. Based on a small indie movie, with obscure Irish references, featuring acoustic folk music (my favorite genre), and no "riding off into the sunset" type of ending, it's not your typical musical. The songs are incorporated organically; instead of characters breaking out into song as dialogue, they sing in the context of a recording session or at a pub. It's pushing the boundaries of what music-theater can be, and I love that. 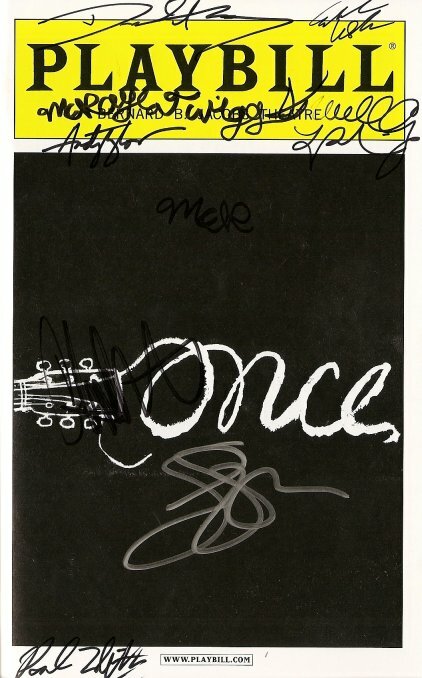 We met most of the cast at the stage door, and they were all very kind and generous with their time (which is usually the case). They all seem to be aware and grateful that they are involved in something special. Here's wishing them a long run on Broadway (and maybe they can get some Guinness for the pub ;). If you're in NYC, it's definitely worth checking out. And make sure to get there early to enjoy the pre-show entertainment - an authentic Irish pub session featuring the talented musicians in the cast singing traditional songs.